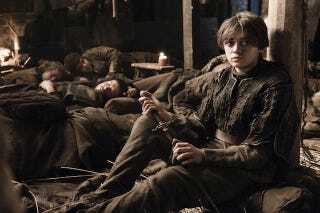 We're used to seeing Game of Thrones' Arya Stark in her functional, rugged clothes, often disguised as a boy. But next season, Arya will be getting a very different look—so different, in fact, that many people didn't recognize actress Maisie Williams the first time she wore it on set. Mild spoilers ahead. When last we left Arya, she was boarding a ship for Braavos, and Entertainment Weekly got a hold of the design for the costume Williams will be wearing in the Braavosi streets. Have a hard time imagining Arya in something so ladylike? You're not alone. When Williams showed up on set with her hair done up and wearing jewelry and a long skirt, many of the crew members failed to recognize her. We can't wait to see it ourselves when Game of Thrones returns.